British prog rockers IQ will release a remixed version of their 1993 album Ever to celebrate the album's 25th anniversary. 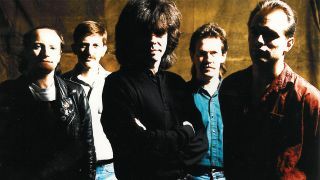 Ever was IQ's fifth studio album, and saw the return of vocalist Peter Nichols after the band had released two albums, Nomzamo (1987) and Are You Sitting Comfortably? (1989) with Paul Menel. The new three-disc set will feature a brand new 2018 remix from guitarist Mike Holmes, newly recorded live versions of the songs from a concert at Aschaffgenberg's Colos-Saal earlier this year, a 5.1 mix of both the new remix and live tracks, demos, studio outtakes, unused ideas and rehearsals and a 40page booklet. It will be released in late September/early October on GEP. Disc 1 (CD): The Darkest Hour, Fading Senses, Out of Nowhere, Further Away, Leap Of Faith, Came Down. Extra tracks: Came Down – The Solos That Got Away, Lost In Paradise. Disc 2 (CD - recorded live at the Colos-Saal, Aschaffenburg, Germany, 10 February 2018): Intro/The Darkest Hour, Fading Senses, Leap Of Faith, Came Down, Further Away, Out Of Nowhere. Album Demos: The Darkest Hour, Fading Senses, Unholy Cow (Out Of Nowhere, Further Away Intro, Further Away Complete, Leap Of Faith, Came Down. Studio Outtakes: Darkest Hour, Fading Senses, Out Of Nowhere, Further Away, Leap Of Faith, Came Down. Unused Ideas: Waltzy Song, Echo Song, The Blues Riff, Bassy Track, Guitar Thing, Quiety Demo, Some Chordage, Monks. Rehearsals: The Darkest Hour (Pt. 2), Fading Senses - Jamming The Riff, Fading Senses #2, Unholy Cow (Developed), Further Away - Jamming The Riff, Further Away - Arrangement, Came Down - Different Intro, Sad Chords.